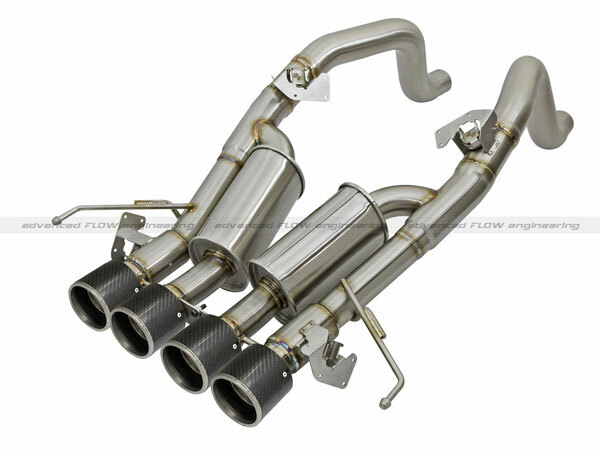 AFE Power 49-34056-C - AFE MACH Force-Xp Corvette C7 Axle-Back Exhaust w/Carbon Fiber Tips W/ Factory Style NPP & AFM Valves; 2014-2019. Exhaust Valve: This axle-back exhaust system incorporates factory style NPP dual mode & AFM (active flow management) exhaust valves which use the factory exhaust valve motors (not included). The valves helps regulate, direct and control the flow of exhaust gases by opening, closing, or partially obstructing passageways depending on throttle position for maximum performance. Simple Installation: This MACH Force-Xp axle-back exhaust system uses factory mounting locations providing stability and a hassle-free installation. Quad 4"" Carbon Fiber Tips: Finishing off this system are quad light weight, 4” diameter, pure carbon fiber tips. The tips come with CNC-Machined laser-etched inserts, which give an aggressive yet elegant sporty look. Brushed 304 SS Construction: The performance axle-back exhaust system is constructed of 3"" mandrel-bent, brushed 304 stainless steel tubing for maximum performance, corrosion resistance and strength eliminating cracking.